Get in the Christmas spirit with the Rotterdam Philharmonic and its music director Lahav Shani! Joined by a world-class group of soloists including Shani himself at the piano, they perform an all-Bach program of festive Baroque masterpieces. The concert opens with Bach’s Second Orchestral Suite, a virtuosic set of French dances for solo flute, strings, and basso continuo whose final movement (called "Badinerie") has become a dazzling showpiece for flutists. Shani then sits down at the piano for Bach’s Harpsichord Concerto in D Minor, BWV 1052. A highly virtuosic, Vivaldi-esque work, scholars believe it to be a transcription of an earlier organ concerto, now lost. Rediscovered by Mendelssohn in the early 19th century, the piece’s enduring popularity has been attested to by its uninterrupted performance history in many different versions, from a modified orchestration that added flute, clarinets, bassoons, and horns (created by a friend of Mendelssohn’s), to the cadenza Brahms composed for the concerto’s last movement, to modern-day performances on the piano. The musicians close with Bach’s incomparable Magnificat, one of the most beautiful musical settings ever composed of the Virgin Mary’s expression of joy at the coming of her son Jesus (as recorded in the Bible). We would like to thank Concert Hall De Doelen for their partnership. 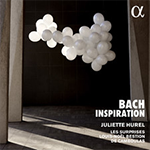 Click here to discover Juliette Hurel's album BACH INSPIRATION.